All the grain flowing from the Dakotas and Western Minnesota to Duluth’s and Superior’s mammoth grain elevators made the Twin Ports a natural spot for flour mills to flourish. The first, Superior Roller Mills, went up across the bay in west Superior in 1882, producing two hundred barrels a day. But shallow water hindered delivery of grain — and the mill’s growth. In 1886 the Duluth Roller Mill arose along the bay at Sixth Avenue West about where Bayfront Festival Park sits today. It began as a small operation, producing about 250 barrels a day. It struggled financially and was sold through a Sheriff’s auction in 1887 and reopened in 1888. That same year pioneer Roger Munger partnered with Bradford C. Church and T. A. Olmstead and established Imperial Mills on the east side of Rice’s Point at 600 Garfield Avenue. While Duluthians had been milling flour for years at a modest capacity, the Imperial Mill — built with what was then considered an experimental design — was considered “the most complete ever built” and at six stories high was by far the largest in the Twin Ports. With crews working day and night, Imperial could pump out 1,500 barrels of flour each day in its new mill, which ran on the power supplied by a 600-horsepower Reynolds-Cross steam engine. By the end of 1889, the facility had increased production to 8,000 barrels a day, an earmark its owners claimed surpassed “previous records of all other flour mills in the world.” That year Imperial built wooden grain elevators #4 and #5. By 1892 Imperial was the largest flour mill in the world, producing 6,300 barrels a day. Red River wheat was delivered to the mill on railroad tracks, shoveled into the mill on one side and rolled out as flour in barrels on the other, loaded straight into vessels docked there in slip #1. At the end of the century, only Minneapolis’s Pillsbury “A” mill could produce more flour than Duluth’s Imperial. Once the largest flour mill in the world and second only in capacity to the Pillsbury “A” mill in Minneapolis, Duluth’s Imperial Mill was built in 1889 of an experimental design. Its foot print measured 110 by 120 feet, and the building stood six stories tall. Chief Engineer Wilson Palmer oversaw all activity in the engine room, centered on a main engine, including the central pump for the fire extinguisher system, built in West Duluth by Marinette Iron Works. Three thousand sprinkler heads fed by rooftop tanks protected the mill in case of fire. A machine and blacksmith shop adjoined the engine room. Wheat was offloaded from trains onto an elevator and then a conveyor belt where it was cleaned and polished into a grain “berry.” On the grinding floor the wheat was broken down to smaller and smaller particles through six separate sets of corrugated rollers before a final smooth set of rollers pulverized it through ten gradations into flour and a byproduct called middlings. The flour and middlings were separated in bolting machinery — essentially giant sifters — on the bolting floor. From there the flour was sent to the packing floor and packaged into sacks before awaiting shipment in the warehouse, which originally had a capacity of 25,000 barrels. Middlings were first purified and then packaged, often sold as feed grain for cattle. The unpackaged wheat, flour, and middling passed from floor to floor through a system of spouts. The third floor was known as the spouting floor and was filled with a maze of spouts which could be checked and tended to by workers known as “spout chasers” who ensured that everything flowed properly. It is only a question of a very few years when the great bulk of the wheat grown in northern Minnesota and the Dakotas will be ground into flour at the head of the lakes. The advantages possessed by Duluth over Minneapolis as a point for milling are too plain to require elaborate illustration. A look at the map is all that is needed. The geographical position of Duluth at the head of deep water navigation is supreme. She sits in the middle of a channel through which the No. 1 hard wheat of the Northwest must naturally find its way to the markets of the East and Europe. Whatever portion of this wheat is used by the Minneapolis mills is diverted from this channel at the expense of those mills and to the proportionate advantage of the Duluth mills, so it requires no lengthy argument to show that Duluth must soon pass Minneapolis as a milling center. It never did. In fact, 1900 would prove to be the industry’s apex in Duluth. 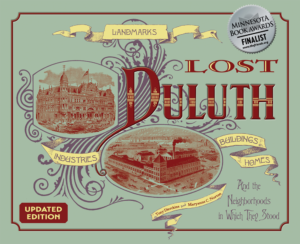 That year Duluth Universal Milling Company opened at the foot of South Twelfth Avenue West, with access to slip #7. W. A. Scott served as the firm’s first president. More flour mills popped up throughout Duluth, including one built by Peavey on Rice’s Point in the shadow of its grain elevators. Consolidation also played a role. Many millers combined their efforts into one organization, the United States Flour Milling Company. The conglomerate turned out to be a bad idea. A number of mills were closed, including Duluth’s mighty Imperial Mill. After changing hands once or twice, it was sold to Duluth’s Capitol Elevator in 1905 with one important clause: the mill could never again be used for the “handling or production of flour.” Capital operated the wooden elevators #4 and #5 and leased the mill, first to then-fledgling Minnesota Mining and Manufacturing — today’s 3M — and later the F. A. Patrick Woolen Milling Company. 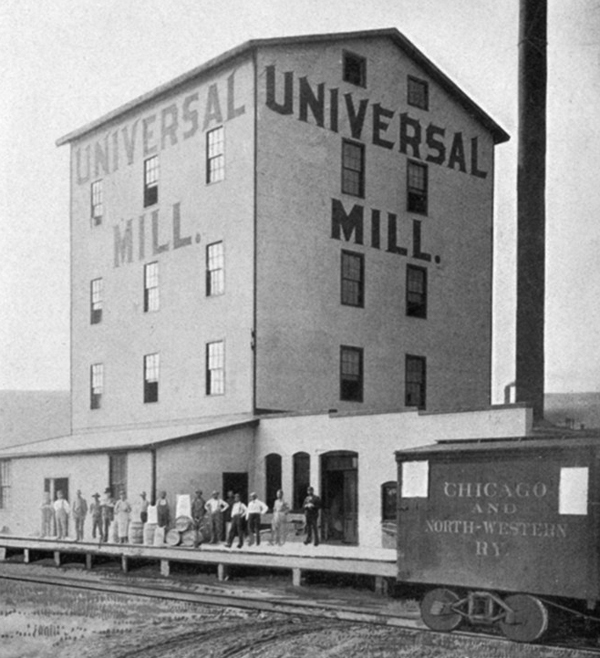 Universal, the last flour mill to operate in Duluth, held on until 1957; it was razed the next year. Peavey operated the former Standard Milling mill in Superior until 1970, when it moved operations to Hastings, Minnesota. By the 1970s International Multifoods owned the Capital elevators, once part of Imperial Mills. They razed Elevator 5 in 1977; the following January a spectacular fire destroyed Elevator 4 and badly damaged an iron ore steamer berthed next to the elevator in slip #1. It burned for more than seven hours, and thousands of people gathered along Skyline Parkway and other vantage points to watch the remnants of the Twin Ports flour industry go up in smoke.